This double-page cartoon in Funniest of Awl portrays the results of the Democratic National Convention, particularly the peace plank of the platform, as a traitorous scheme to collude with the Confederacy. Presidential nominee George McClellan presents his tools to Confederate President Jefferson Davis, who smiles in satisfaction as he stands on the American flag. Behind Davis, Union soldiers grovel at the feet of Confederate troops, above whom a grief stricken Lady Liberty flies away. In the center background, a black man complains in an aside about Democratic hypocrisy. 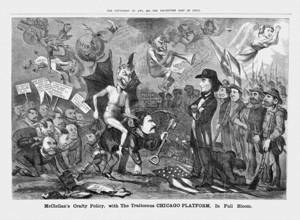 General McClellan is ridden by the Devil, whose tail is in the mouth of vice-presidential nominee George Pendleton, a Peace Democrat and congressman from Ohio.